Rodan is a giant red pterodactyl like kaiju. Rodan has two curved horns towards the back of it's head. Rodan has a body coated in sharp armor like scales. Rodan is one of the many kaiju that have retired to Monster Island and tries to spend it's time peacefully. Rodan has the ability to fly at extremely high speeds and leaves a path of mass destruction from the sonic booms and high winds that are created as it flies over cities. Rodan also uses its sharp spiky armor to cut his enemies. Rodan can also create massive hurricane like gust that can blow his enemies away. In the later years a young Rodan hatchling learned the ability to fire heat beams from it's beak. Rodan first appeared in it's own self-titled movie Rodan. 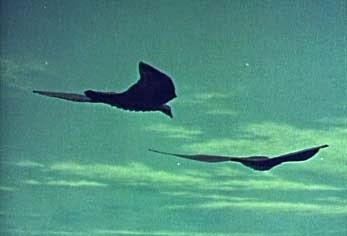 In the movie Rodan there were two Rodans that terrorized Earth's skies. These two Rodans were defeated by Japan's military. The military used strategically placed explosives to set off a controlled volcanic eruption. As the Rodans were flying over the volcano ,the fumes and gases from the eruption caused the two Rodans to fall from the sky and into the molting lava. It was believed that both Rodan were killed in the volcano's eruption, but we soon learn a few years later,in Ghidorah,the Three-Headed Monster that at least one of the two Rodans had survived the flames of the volcano. Rodan rises out from the Volcano and fights Godzilla. Mean while earth is being invaded by the alien monster Ghidorah. Godzilla and Rodan seem pretty evenly matched in their battle both monsters having highs and lows in the fight against each other. Mothra soon arrives and interrupts this battle between Rodan and Godzilla , and gets them to stop fighting instead to team up to stop the seemingly unstoppable Ghidorah. Along with Godzilla, and Mothra, Rodan helps them beat on Ghidorah and send the Three-Headed Monster back to space. Not long after Ghidorah's first defeat, Rodan once again teams up with Godzilla in the Invasion of The Astro-Monster. Rodan and Godzilla at first are under the control of the aliens from Planet X and are used to bring destruction and chaos to Japan. Rodan is eventually freed from control along with Godzilla. At the time Planet X had also captured and had taken control of the monster Ghidorah. But once Planet X lost control, Ghidorah became disoriented when he saw that he had to face Godzilla and Rodan again. Once again Rodan and Godzilla defeat Ghidorah and force him to retreat back into space once more. Just when you thought Rodan would not have to fight along side Godzilla again, it happened again a few years later in Destroy All Monsters. Once again in Destroy All Monsters an Alien race called the Kilaaks has taken control of every monster on earth. After a long hard fought battle by the humans of earth all the monsters were freed of alien control. The Kilaaks had one more monster that they were confident the earthlings could never free of control, that is right possibly Rodan's greatest nemesis Ghidorah. This time Rodan joined battle not only with Godzilla at his side but every kaiju on the planet was fighting Ghidorah. This time Rodan and the monsters of Earth defeated Ghidorah and there was no retreating this time the Three-Headed Monster was finally killed. For many years Rodan lived in piece on Monster Island as we saw in Godzilla vs. Gigan, Godzilla vs. Megalon, and Terror of Mechagodzilla. Rodan did not have to face battle again until many more years later in Godzilla vs. Mechagodzilla II. This time we saw a new Rodan hatch from an egg. This new young Rodan was over confident and picked a fight with Godzilla. Rodan was almost killed in this battle with Godzilla and just scrapped by narrowly avoiding death. The young Rodan eventually recovered later on and discovered it's new heat beam power. Rodan was not the only hatchling on the island at the time of the Godzilla fight there was also an egg next to Rodan's that housed a baby Godzilla the two being near each other for so long had created a psychic bond. Baby Godzilla was taken to Japan for research to figure out how to defeat the adult Godzilla with the use of the new man made Mechagodzilla. Rodan along with Godzilla rushed to Japan to save baby Godzilla but were met by Mechagodzilla. Japans Mechagodzilla task force quickly dealt with Godzilla and Rodan. The Mechagodzilla force was more concerned with killing Godzilla and paid no attention to the dying Rodan. In Rodan last moments Rodan used its remaining life energy and sacrificed it self to save the dying Godzilla. Rodan's sacrifice saved Godzilla and ultimately gave Godzilla the energy and power to defeat Mechagodzilla. 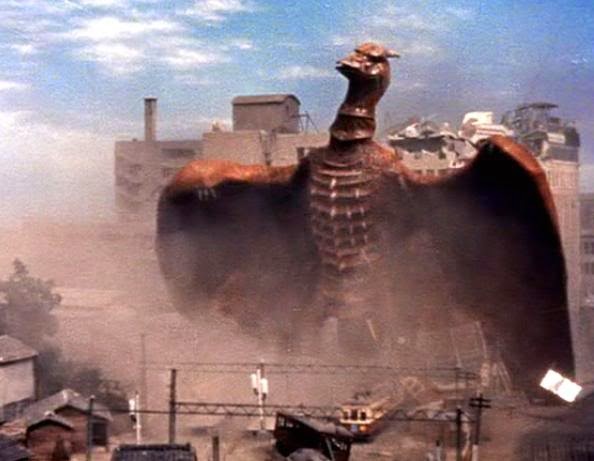 Rodan once again appeared shrotly in Godzilla: Final Wars and was taken control of by the Xiliens. 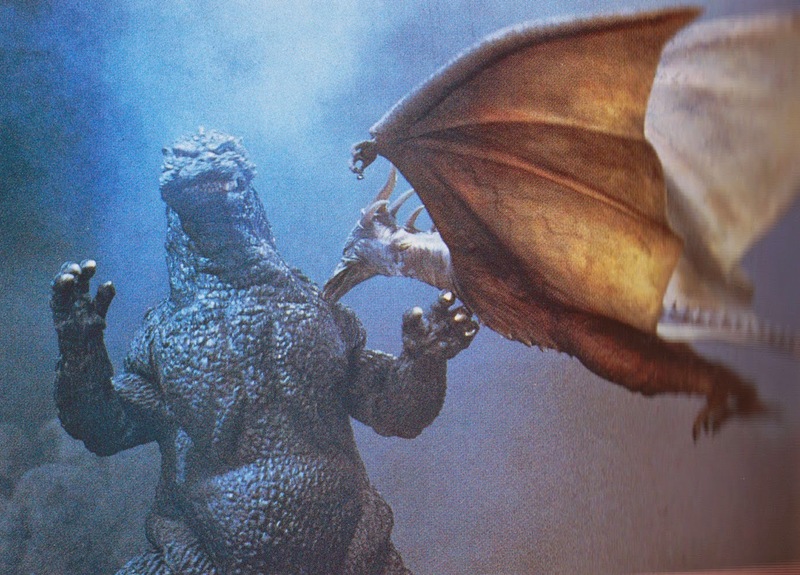 The Xiliens used Rodan to fight Godzilla but in this fight Rodan was no match for Godzilla and was quickly put down. The origin behind this this Rodan is not really explained that well was this another hatching? Was it the Original Rodan from Monster Island? or was it the second Rodan that feel into that Volcano many years ago only to rise out of it many years later and not know the power of Godzilla? Rodan in my opinion is one of Godzilla's greatest allies. Rodan has helped Godzilla defeat Ghidorah on three occasions, and sacrificed it's life in order to save Godzilla's. Rodan is one of the greatest kaiju's to ever live, Rodan is Godzilla's number one tag team partner when it comes to fighting aliens and Ghidorah (except for that one time Godzilla teamed up with Anguirus to fight Gigan and Ghidorah). Rodan is no doubt a favorite of many Kaiju fans around the world.